Royal Caribbean's Empress of the Seas rescued two stranded mariners who had been at sea for 20 days, somewhere between Grand Cayman and Jamaica. Royal Caribbean Chief Meteorologist James Van Fleet shared the update, with photos of the rescue at sea being conducted by Empress of the Seas officers and crew. What makes the rescue even more remarkable is the fact Empress of the Seas was not scheduled to be there. Due to adverse weather conditions on Empress' original route, the ship's itinerary was altered and ended up "being in the right time, at the right place." Royal Caribbean announced today it is doubling its sailings to Cuba in 2018, with two ships offering cruises there - Majesty of the Seas and Empress of the Seas. In addition, Royal Caribbean is adding two new destinations to itineraries. 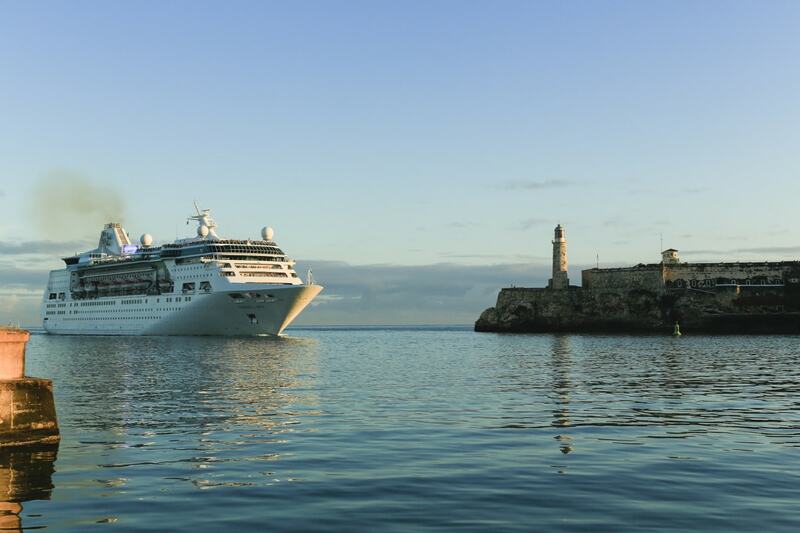 The new Cuba ports will of Santiago de Cuba and Cienfuegos on the southeast coast, will be visited by Royal Caribbean and add a new dimension to an array of 4- to 8-night Caribbean adventures on Empress of the Seas that open for sale today. Departing from Miami year-round, Empress cruise vacations will include 7-night Best of Cuba itineraries to Cienfuegos, Havana and Nassau, Bahamas; 5-night sailings visiting Key West, Florida and spending the night in Havana; and an immersive 8-night journey to Cienfuegos, Santiago de Cuba, Grand Cayman, and Labadee, Haiti. Majesty of the Seas will continue the 4- and 5-night offerings to Havana that include day and overnight stays, departing from Tampa from April to October 2018, and Ft. Lauderdale from November 2018 to March 2019. 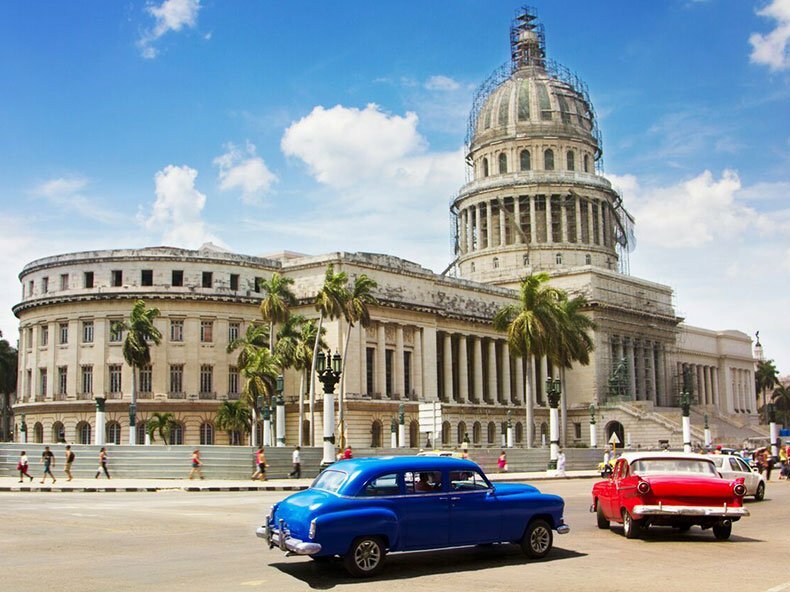 All sailings to Cuba will offer shore excursions designed for guests to experience the destination and to comply with the people-to-people educational exchange activities requirement as set forth in the U.S. regulations. Royal Caribbean informed travel partners that four of its cruise ships will be redeployed in 2018-2019. 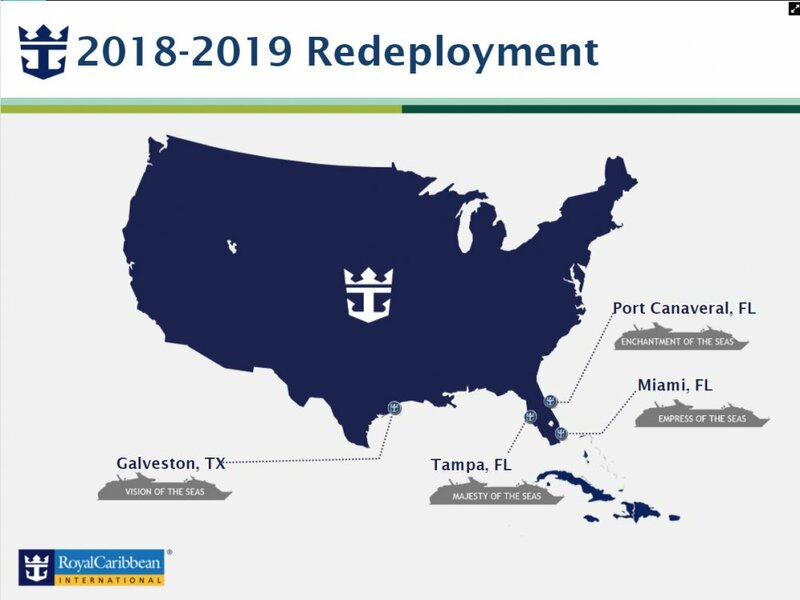 In an unusual occurrence, Royal Caribbean is changing the deployment of ships that have already been announced. Much of the change is merely swapping one cruise ship for another, but there are some cancellations included as well. Majesty of the Seas will move to Tampa for sailings between 6/22/18 - 4/29/19. The following Majesty of the Seas sailings are being cancelled: 5/7/18 - 6/18/18. Guests on these canceled sailings will have their ship changed to Enchantment of the Seas. Empress of the Seas sailings for 5/9/18 - 3/30/19 will be changed to Majesty of the Seas. In addition to the change in ship, the 6/25/18, 8/6/18, 9/3/18, 9/17/18, and 10/1/18 sailings' itineraries will be modified. Guests on these sailings will be moved to Vision of the Seas, a ship in the same class. The following Enchantment of the Seas sailings are being cancelled: 6/23/18 - 3/13/19 & 4/19/19. Vision of the Seas is being moved to Galveston. The following Vision of the Seas sailings are being cancelled: 3/9/19 - 4/13/19. New sailings will be open and ready to book on November 21st, 2017. 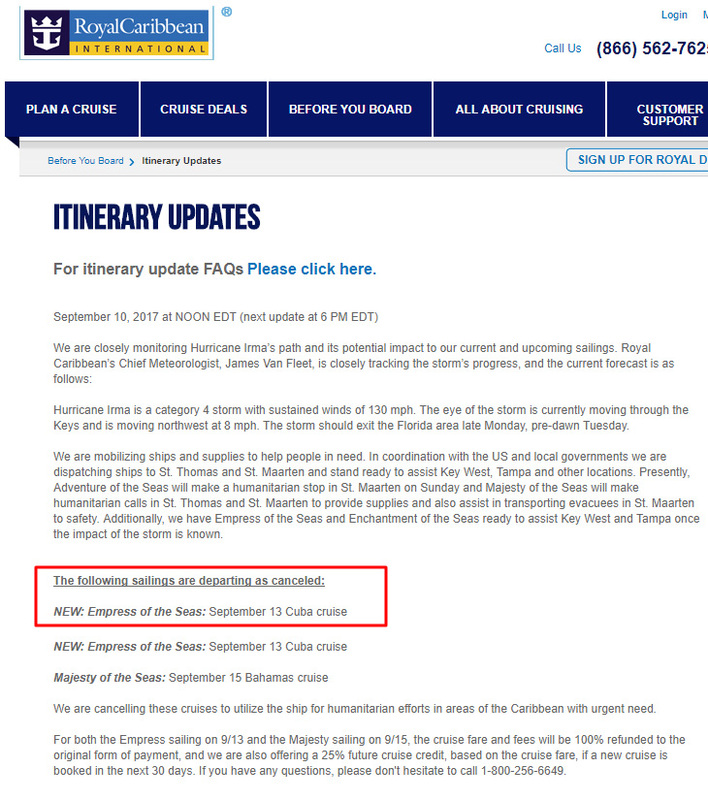 Royal Caribbean announced today it has cancelled the September 13th sailing of Empress of the Seas sailing to Cuba due to Hurricane Irma. Royal Caribbean decided to cancel this sailing, along with the September 15th Majesty of the Seas sailing, to utilize the ship for humanitarian efforts in areas of the Caribbean with urgent need. Empress of the Seas and Enchantment of the Seas are ready to assist Key West and Tampa once the impact of the storm is known. For both the Empress sailing on 9/13 and the Majesty sailing on 9/15, the cruise fare and fees will be 100% refunded to the original form of payment, and Royal Caribbean is also offering a 25% future cruise credit, based on the cruise fare, if a new cruise is booked in the next 30 days. If you have any questions, please don't hesitate to call 1-800-256-6649. Hurricane Irma is a category 4 storm with sustained winds of 130 mph. The eye of the storm is currently moving through the Keys and is moving northwest at 8 mph. The storm should exit the Florida area late Monday, pre-dawn Tuesday. Royal Caribbean has expanded its cruises to Cuba on Empress of the Seas with 58 cruises of 4- and 5-night itineraries from January 2018 through March 2019, more than half offering overnight stays. Empress of the Seas will return to Tampa for summer 2018, offering a series of 4- and 5-night cruises, calling on Key West, Florida, and Costa Maya and Cozumel, Mexico, as well as Havana, Cuba on most sailings. The ship will reposition to Port Everglades in Fort Lauderdale, Florida for the winter 2018-2019 season, continuing short Caribbean adventures to the Caribbean destinations. Currently, Empress sails from Tampa through Nov. 4, 2017. The ship then returns to Miami for the winter 2017-2018 season, adding calls to Royal Caribbean’s private island destination CocoCay and Nassau in The Bahamas. "Since arriving in Cuba for the first time last month, we’ve seen the excitement of our guests when sailing into Havana and the passion they have for the city at sail away – its people, its architecture, its food, its music. This is the enthusiasm we strive to bring to adventure-seekers who vacation with us," said Michael Bayley, President and CEO, Royal Caribbean International. "The positive reaction to our Cuba sailings is very encouraging, and we are thrilled to expand on the number of sailings for our 2018-2019 itineraries." 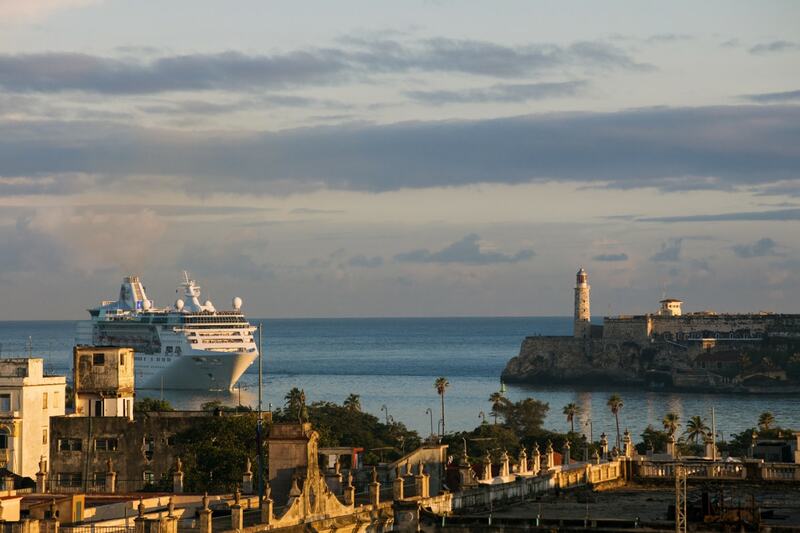 Royal Caribbean's Empress of the Seas arrived in Havana, Cuba earlier this morning, marking the first Royal Caribbean International ship to stop in Cuba. Thanks to Halee Whiting for providing these photos. Empress of the Seas departed Miami earlier this week, as part of a 5-night sailing that culminated with an historic first visit to Cuba. The cruise has been filled with a number of special events and festivities, from cortaditos and café con leche in Café Royal to salsa music and dancing in the Boleros Latin lounge. 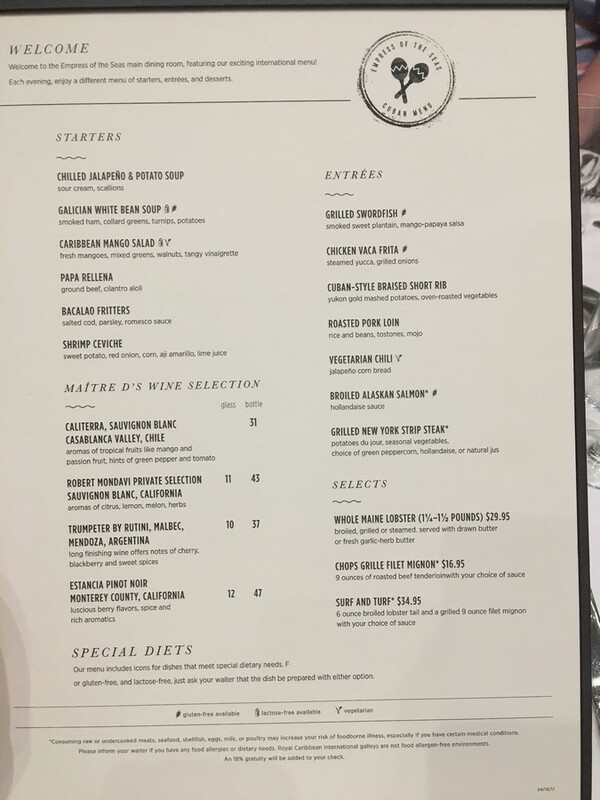 There was even a special Cuban-inspired dining room menu. After months of negotiating, Royal Caribbean announced it would offer cruises to Cuba in December 2016. Royal Caribbean offers regular sailings to Cuba, including some sailings with an overnight visit, through the end of 2016, along with stops in Key West, FL. and Cozumel, Mexico. We will update this post with additional photos and coverage as the day progresses. Keep checking back. Royal Caribbean's Empress of the Seas set sail today from Miami, Florida marking the beginning of an historical voyage that will mark Royal Caribbean International's first visit to Cuba. Guests boarded Empress of the Seas to the tune of live music, Cuban coffee and Cuba Libres served to guests as they boarded. Empress of the Seas is on a 5-night inaugural sailing to Cuba, which will make the historic visit to Havana, Cuba on Sunday, April 23, 2017. As guests boarded Empress of the Seas, Royal Caribbean had special Cuba photo opportunities set up, along with plenty of fanfare. 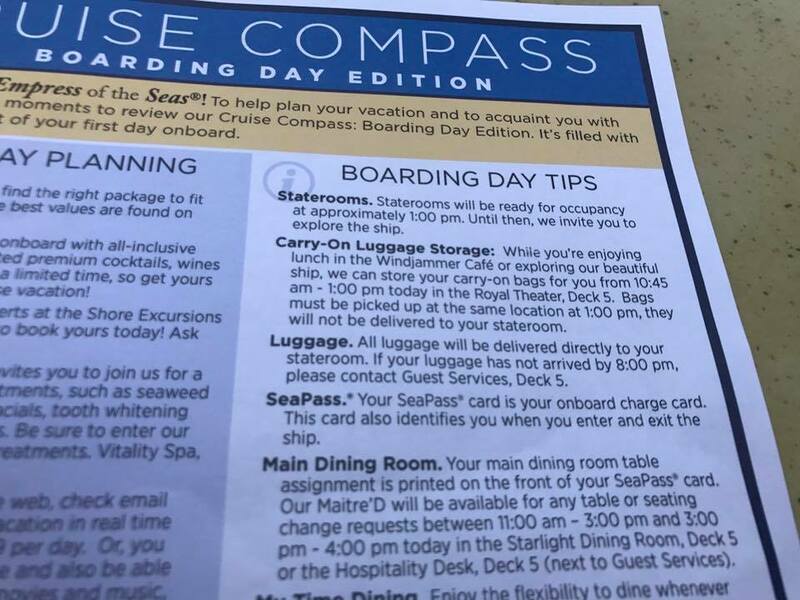 Royal Caribbean Blog reader Halee Whiting shared the first two days of the Cruise Compass from Empress of the Seas. Royal Caribbean brought Empress of the Seas back into its fleet in early 2016, specifically because its size was a perfect fit for Havana harbor. Guests sailing on Royal Caribbean's Empress of the Seas might be able to take advantage of a new service to store their carry-on bags until their stateroom is ready. The carry-on luggage storage service was spotted on Empress of the Seas current sailing. Guests have the option of taking their carry-on luggage to the Royal Theater and leave their belongings there from 10:45am to 1:00pm. Guests must reclaim their bags when they want to bring them to their stateroom. We saw something similar offered on Grandeur of the Seas on past sailings. Just days after receiving approval by the Cuban government to offer cruises, Royal Caribbean has put its first ever cruises to Cuba on sale to the public. As expected, Empress of the Seas is offering a few different itineraries, from Miami and Tampa, Florida. 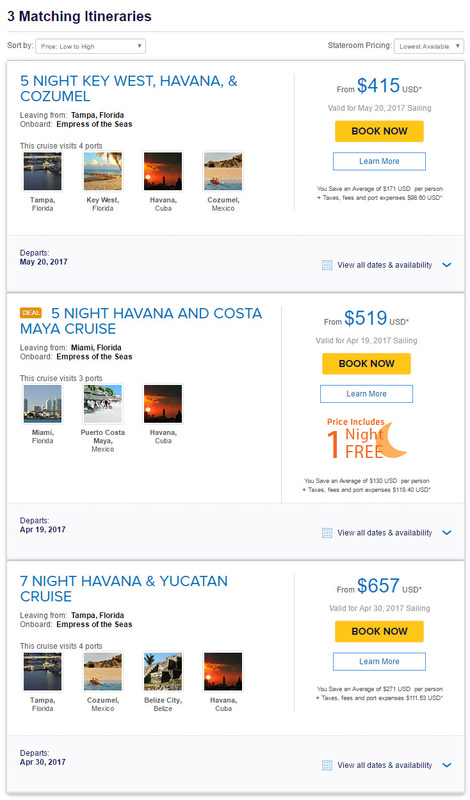 The first sailing is scheduled for April 19, 2017 and is a 5-night cruise from Miami to Costa Maya, Mexico and Havana Cuba. Empress of the Seas will homeport in Tampa for the 2017 summer season offering a series of 4- and 5-night sailings, including port calls to destinations in Cuba. The largest ship to sail to Cuba from the United States, Empress will provide vacationers with the opportunity to discover the timeless sights, sounds and culture of this island nation. Details of the summer itineraries will be released at a later date. All cruises will be designed in accordance with current U.S. to Cuba travel regulations. "Royal Caribbean is the world’s most exciting adventure company, and we’re thrilled to introduce culture-seeking travelers to Cuba. As the unrivaled innovators of the cruise experience, no company is better positioned to help adventurers explore and experience this culturally rich destination," said Michael Bayley, President and CEO, Royal Caribbean International. Will you be booking any of these cruises? Tell us in the comments! Tropical Storm Otto has forced Royal Caribbean to make an itinerary change to Empress of the Seas' scheduled itinerary. In a letter distributed to guests onboard, the ship's Captain explained the storm's effect of high winds and rain in the vicinity of Falmouth, Jamaica are expected to significantly disrupt the guest experience. 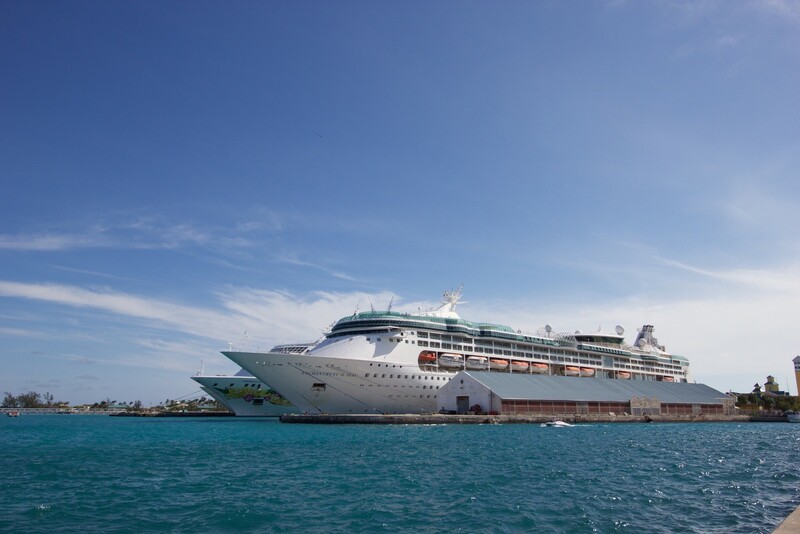 Therefore, Empress of the Seas will visit Ocho Rios, Jamaica instead on November 24 from 8:00am to 4:00pm. Due to the proximity of Ochio Rios to Falmouth, shore excursions booked with Royal Caribbean will continue to run as usual, with just three exceptions.